Dual-core Llano CPU performs a little bit slower than AMD Athlon II X 250 (3.0 GHz) and Intel Pentium E6500 (2.93 GHz). 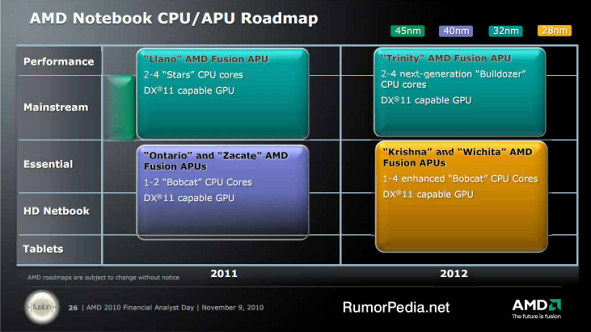 When it comes to graphics, integrated Fusion APU massively outperforms Radeon HD4290 and G31 chipsets. Quad-core Llano CPU performs in line with AMD Athlon X4 640 and Intel i3 540 while GPU has similar performance numbers as discrete AMD Radeon HD 5500 and 5600 series graphic cards. Furthermore, Llano power consumption (TDP) is 65W and 95W respectively. According to leaked slides, AMD Llano should be available later this summer.